Sometimes when I feel like baking I’m not sure what to make. Do you remember back in school when you had art classes and the teacher wouldn’t tell you exactly what to draw, but instead you had to draw according to a theme or a feeling? It could be pink, Summer, black and white or happiness. You’d think about it for a while, and then suddenly it just appeared to you what you should draw, you just knew, and you’d think it was quite interesting because you ended up drawing something you otherwise wouldn’t think of. Well, it was a bit like that the other day. Theresia at the blog Söta saker is almost every month hosting a activity for bloggers in which she tell you a theme and you bake something that fits and then you blog about it and at the end of the month she put up a great, big blog post with all the entries in it. The theme of January is “mjuka kakor” which I’d like to translate to cakes, but not the fancier cakes with lots of fillings, icing and decorations but more like simple tray bakes and loaf cakes. I decided to give it a go and try to figure something out, just like in art class. It didn’t take much thinking to get a good idea, I’m a very creative person. 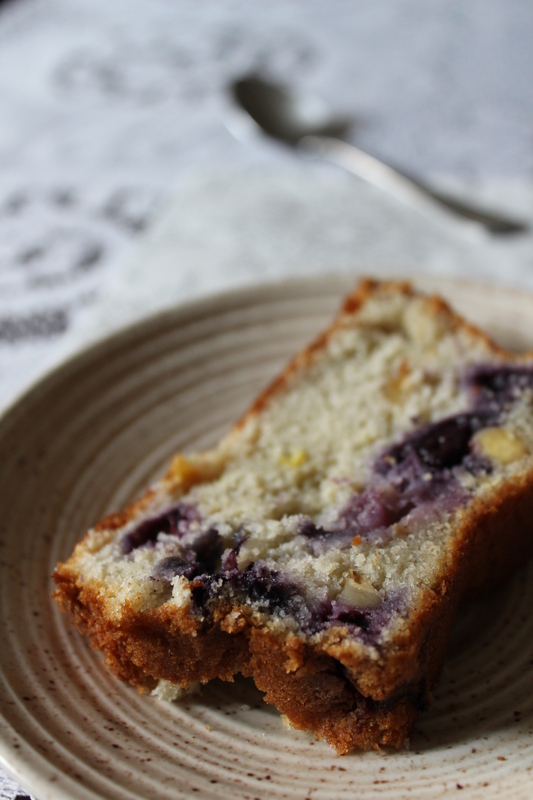 I simply thought of one single flavour and thought of things that go with that flavour, the result is a buttermilk cake with blueberries, lemon zest and juice and chopped almonds. Do I need to say more? The buttermilk make the cake slightly tangy in a soft way which contrast against the sharp tangyness of the lemon and the blueberries and the almonds add a sweet, rich and nutty contrast. And of course, there’s vanilla in there too hiding in the background and together with the other ingredients providing the canvas on which the main flavours can go. This cake is very crumbly when it comes out of the oven, but the taste is still perfect. The day after baking it’s even better; it’s not crumbly and it’s very moist. It’s not common to line baking tins in Sweden, we usually just grease and flour the tins and sometimes we actually use breadcrumbs instead of flour. I didn’t use breadcrumbs for this cake, but the result of not lining the tin is still a slight crust that makes the eating experience nicer because it provides yet another texture change and some extra flavour. Put the oven on 175 degrees C/350 degrees F (150 C/300 F if you’re using a convection oven). Beat the sugar, butter and the vanilla together until it’s light in colour. Put the egg in the mixture and beat for 2-3 minutes. Add the buttermilk and mix together until it’s just come together. Mix the flour with the salt and fold in in the batter until it’s well combined. If you’re using frozen blueberries, defrost them, strain the juice and mix with a bit of cornflour to absorb the extra moisture. Toast and halve the almonds. Put the blueberries, almonds and zest in with the batter and fold it in gently; you don’t want to mash the blueberries. Grease and flour (no need to line it) a loaf tin approximately 10×22 cm, a little bit smaller or bigger doesn’t matter. Bake the cake in the oven for about 35-45 minutes (I didn’t time it exactly, sorry!) until a skewer comes out clean. This entry was posted in Cakes and tagged almonds, blueberry, blueberry cake, buttermilk, cake, lemon. Bookmark the permalink.